The outdoor room is a normal part of most people’s lives these days, and the increasing variety of styles and configurations in patio furniture have precipitated a need for a new kind of umbrella. Treasure Garden has been on the leading edge of patio furniture accessories for nearly 30 years, so it Is no surprise that they have anticipated the need for larger and more varied shapes in patio umbrellas. The 8’ x 10’ Deluxe Auto Tilt Umbrella is one of those. Based upon the best-selling 9’ Deluxe Auto Tilt Umbrella, the 8’ x 10’ style is the ideal shape and size for larger rectangle and oval tables that can seat anywhere from six to 12 people. Not only does the unique rectangular shape of the 8’ x 10’ Deluxe Auto Tilt Umbrella work beautifully with these larger tables, it is also equipped with an auto-tilt feature that allows you to stay in the shade from dawn to twilight. You simply crank the 8’ x 10’ Deluxe Auto Tilt Umbrella and as you crank you will see that the canopy begins to tilt. You will appreciate this feature when the sun is in your eyes; a flick of the wrist and the problem is solved. 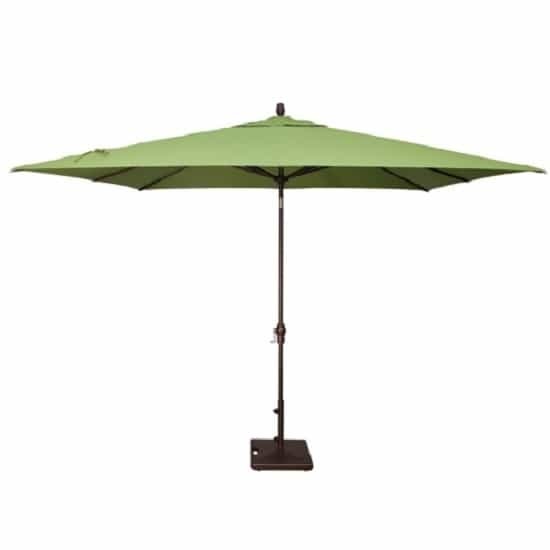 Treasure Garden has never relied solely on their innovative designs; this umbrella, like all of their patio accessories, is constructed from premium grade materials. The umbrella pole is heavy-duty, rust-free aluminum that is finished with your choice of bronze of black powder-coating. The 8’ x 10’ weather-friendly canopy offers 80 sq. ft. of shade; choose your favorite color or pattern from Treasure Garden’s huge selection of fabrics. 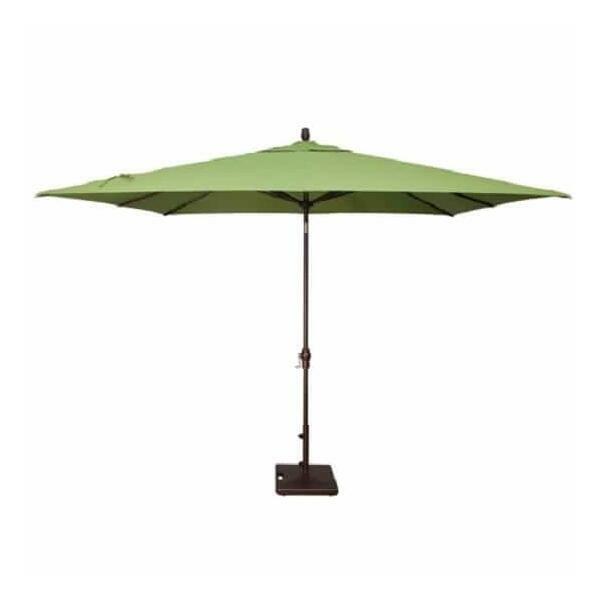 You and your guests will stay cool, calm, and collected under the 8’ x 10’ Deluxe Auto Tilt Umbrella by Treasure Garden.